Two recent developments almost ripped apart the government’s claims that it was determined to unearth black money. Last week most market watchers were left stunned with wide-mouthed amazement. Two developments almost ripped apart the government’s claims that it was determined to unearth black money. One was, obviously, the Punjab National Bank scandal involving some Rs.11,400 crore. The Enforcement Directorate (ED) has issued summons for appearance to billionaire diamond merchant Nirav Modi and his business partner Mehul Choksi in connection with its money laundering probe. The ED notice is laughable because a similar ED notice was issued in the case of liquor baron Vijay Mallya as well. And everyone knows how far that notice has reached. The Mallya case is equally distressing because, just last week, the media was full of news about how a small Singapore company, BOC Aviation, managed to get the London courts direct the absconding Mallya to pay (to BOC) damages of $90 million. Here was a small Singapore company that could make London courts slap a damage charge against Mallya. And here was India – a country with a battery of smart lawyers – unable to get even one favourable judgement from London. It pointed to India’s abject incompetence, and the Opposition alleges collusion. Coincidentally, two Modis (Lalit Modi and Nirav Modi) and Mallya are now overseas. All the three managed to escape the CBI and the ED. True, the ED now claims that they have attached assets (belonging to Nirav Modi) worth Rs.5,100 crore. But weren’t assets seized and attached even in the NSEL case? Why were those assets not liquidated and the defrauded investors reimbursed? Why should one believe that this time round, the ED will actually liquidate assets to make good the losses? India’s investigative and judicial system has much to answer by way of explanation to the queries raised above. In fact, the Nirav Modi case raises more questions than the government has cared to answer. First, how is it that G. Shetty – the man who is alleged to have allowed Nirav Modi to take large sums of cash from PNB – was not exposed for almost seven years. Surely, he must have gone on leave for some time during these years. Surely, the Core Banking System (CBS) should have registered these transactions! After all, all SWIFT-related transactions have to get reflected in the CBS, which is part of the Finacle Banking solution developed for Indian banks by Infosys. Then there is the SWIFT system itself. Senior bankers will tell you that — at least till a few years ago — all transactions required two independent officers to ratify a SWIFT transaction. This was known as the system of double control. Hence Shetty could not have been working alone. His entries had to be authenticated by another officer as well. Was the software tinkered with in such a way that only one person could authenticate a transaction? Is Infosys giving its inputs to the investigators? Or has the RBI come up with fresh regulations allowing only a single authentication to be adequate? Moreover, senior bankers also talk of how loans against bank guarantees are normally discouraged by banks. A Letter of Undertaking (LoU) is one kind of bank guarantee. So how were loans permitted against LoUs (see PNB letter – pg 1 given above; the full document can be viewed here)? And even if they were, why was the norm of 110 percent margin money requirement waived? Banks have conventionally insisted on 110 percent margin money for any kind of advance taken from any bank against a bank guarantee or an LoU. 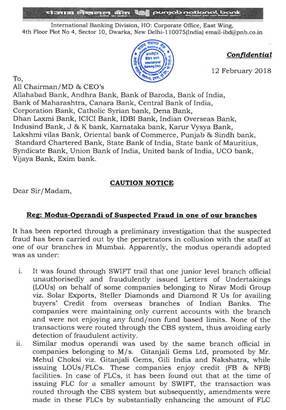 Why were Nirav Modi’s companies allowed to raise money from different banks on the basis of such LoUs, which were supplied without the margin money of 110 percent being deposited with the bank? Finally, how is it that such frauds get discovered only after the key people involved have flown away? Nirav Modi has flown away, and Shetty is untraceable till the time of writing this article. There is no mention of his fellow collaborators either. There is no explanation regarding the reasons why two officers who were required to authenticate the SWIFT transactions remained in their positions of authority for seven continuous years. Normally such positions are rotated, to ensure that collusive arrangements do not continue for long periods of time, and also to ensure that such arrangement s come to light. Nor is there any mention of the brokers who received their commissions for arranging funds from other banks on the basis of such LoUs. According to some reports, the brokers got their commissions from the same branch of PNB. In fact, the silence on the issues raised above only reinforces the fear that India loves black money. True, legislators love to talk about their determination to root out corruption. But look at events very closely, and you will discover more acts that smack of collusion than determination (to root out black money). #1 Consider how a Singapore company could get the UK courts to compel Mallya to pay it $90 million; and India’s inability in getting even one favourable UK court order against Mallya after all these years. #2 Consider how the big fish always manage to escape India’s law enforcement machinery. Clearly, this should be a case of dismissals on account of ineptness and incompetence. Or it should be a case of hauling some enforcement officers over the coals for collusion. The silence suggests collusion at this stage as well. #3 Consider again, how the Aadhaar scheme was allowed to sail through even though India’s authorities knew that this was merely authentication, not identification. The Aadhaar biometrics could have been included under the NPR (National Population register) which actually identifies. Thus, anyone could, even if he were a Nepali or a Bangladesh national, manage to get an Aadhaar card on the basis of a bogus ration card and a bogus election card (because the Aadhaar system merely checks documents without getting them cross verified, and without getting the person identified by other people. Given that as many as half a billion Aadhaar cards could be defective, the numbers of unidentified Aadhaar cards could be almost half the number issued. Since each bogus identity is a unique individual (Bangladeshi, Nepali or who have you), his/her biometrics will not be duplicated, hence never come to light as a fraudulent recipient of an Aadhaar number. The decision of NPCI (National Payments Corporation of India) to link the latest bank account to an Aadhaar number is equally perplexing, because the system overwrites the previous bank account number. This removes any possibility of tracking the amounts received from the consolidated funds of India as subsidy reimbursements paid over a period of time. That the loopholes in the UIDAI and NPCI systems took place when key people from Infosys were at the helm of affairs at both companies is rather unfortunate. Is the FCRA being amended retrospectively? Then take two other reasons why there is growing scepticism about India’s stated resolve to root out corruption. The first relates to the emailed letter EAS Sarma, former Economic Affairs Secretary, Government of India, wrote to the finance minister Arun Jaitley on 3 February 2018 (see pix of the first page alongside, and the full email here). The email letter goes on to say “To amend an existing law retrospectively to permit the political parties to accept donations from foreign companies raises serious concerns about the government's intentions vis-a-vis the likely influence of foreign agencies over the electoral process in India and its likely adverse implications for the national interest. 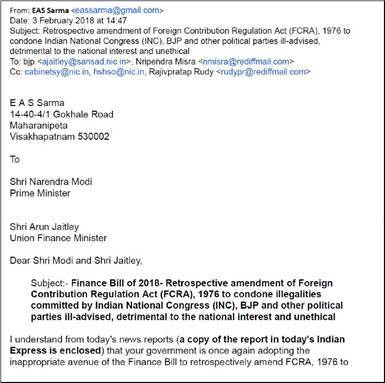 Both the FCRA of 1976 and the FCRA of 2010 rightly prohibited political parties and their members from accepting donations from foreign sources. The Representation of the People Act echoed these prohibitive provisions. It goes to the credit of the Parliamentarians at that time to have thought about the deleterious implications that foreign donations could have on the political parties and their implications for the national interest. Despite such clear legal provisions, both Congress and BJP blatantly sought and accepted donations from foreign sources year after year. Thus, instead of complying with the orders of the court, the government now appears to be willing to change the laws retrospectively/ That would allow political parties the liberty to conceal the source of their funding. Since such an allegation has been made before the courts, and since the government has not responded to the order of the courts, one is inclined to believe that the allegations are true, and that it is the politicians who have actually abetted and promoted the creation of black money. If the allegations are true, it would explain the desire of the legislators to conceal the source of funds, and thus allow the black-money to go undetected. There is one more reason to believe that the government has no real desire to unearth black-money. 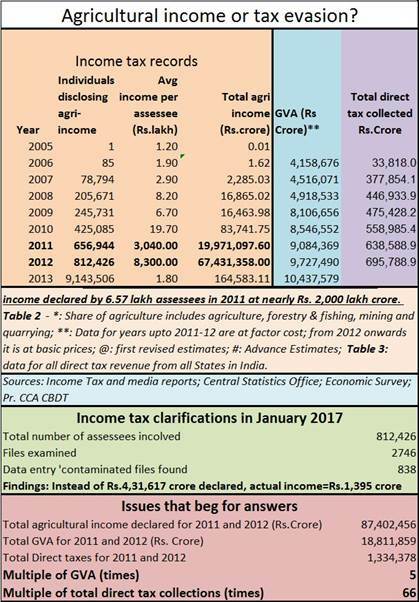 It related to the disclosures of agricultural income that were made to the income tax authorities during 2011 and 2012. What makes those disclosures preposterous is (a) they were larger than ever before, (b) the cumulative value of disclosures during the two years was a mind-boggling Rs.874 lakh crore. (c) the cumulative value of disclosures were eight times India’s GVA for 2013, and almost 100 times the total tax collected in a year. The amounts were so staggering that any income tax officer would have dismissed them. Unfortunately, today, the income tax department is not in a position to either dismiss them, or even accept them. To dismiss these declarations would require them to file cases of wrongful disclosure against the declarants (because under the income tax laws any income above a certain limit must be fed in by the declarant online, and swear to the authenticity of these declarations). It is reasonable to believe that such large declarations could only have been made by very powerful and extremely wealthy people (many of them possibly politicians). Prosecuting them on a large scale (around 8 lakh such assessees) would be inconceivable. To accept such declarations that were eight times a country’s GDP would immediately raise a hue and cry about how the country had been looted all these years. That is why the disclosures and submissions have remained with the income tax department like a hot potato. 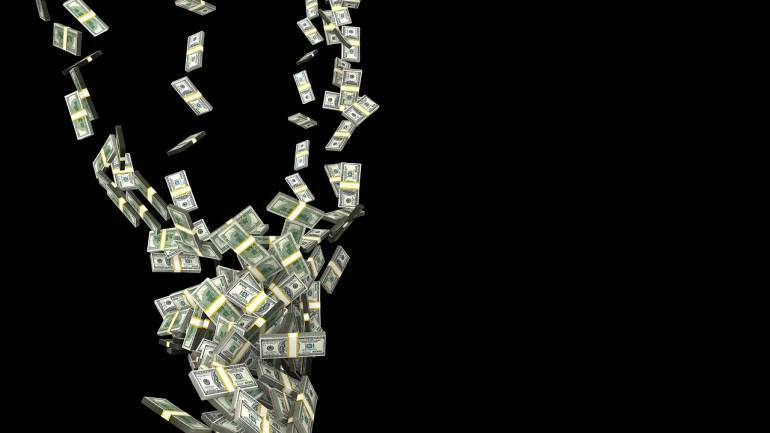 They bear testimony to the government’s unwillingness to root out black money. They also seem to explain why the government had been unwilling to go after the people whose names had been disclosed in the St Kitts exposure and the Paradise Papers episode. That the government did begin an investigation was on account of the directives given by the Supreme Court. That is why many do not take the governments protestations over the PNB fraud at face value. Many believe that someone in the government must have had a hand in allowing these diversions of funds to take place. How else can one explain the LoUs being accepted without the double control mechanism of the SWIFT keys? How else does one explain the disclosure coming to light after the key persons had fled the coop? That could also explain why even though bank managers have been hauled up for the NPAs, not a single legislator or Politically Affiliated Person has been hauled up for compelling bank authorities to give loans to undesirable borrowers. That the PNB loot began seven years ago, and continued till recently, puts both the Congress and NDA governments under a harsh spotlight. So what will the outcome be? Your guess is as good as mine. The only thing that is certain is that there remain more questions than answers at this stage.